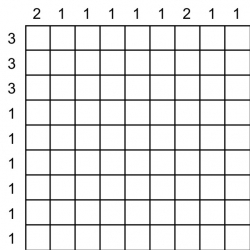 Blacken cells is played on a square grid. - Each row and each column contains two black cells. - No black cells touch each other, not even diagonally. - Numbers outside the grid show the quantity of white cells between black cells in corresponding row or column.